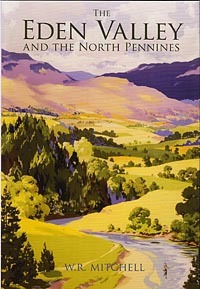 The north-south valley of the Eden is a broad fertile strip between Lakeland and the high moors of the Pennine uplift. The river rises at Mallerstang, where Wild Boar Fell forms a magnificent backdrop, and is noted for its run of salmon and for the trout fishing enjoyed in the upper reaches. In its course of 67 miles to the marshes of Solway Firth it passes two historic towns, Kirkby Stephen and Appleby, and the city of Carlisle, the entry point for Scottish raiders in a more turbulent past. Presiding over the northern Pennines is Alston, one of the highest market towns in the land. The Eden Valley provides a limestone setting that, in its middle and lower reaches, assumes a rosy appearance from New Red Sandstone, best seen in the spectacular gorges so beloved by the Romantic Age. On the flanking Pennine hills are scars left by leadminers, austere monuments to whose industry might still be visited by today’s tourist, but the region is generally rural in appearance and home to formerly grand estates, quiet villages and a scattering of farms. It becomes known as the ‘golden vale’ when the cereal crop ripens under the summer sun. The celebrated stone circle known as Long Meg and Her Daughters is the oldest indication of human settlement in the region. The Vikings left hogback gravestones and the Normans a legacy of castles, their medieval forest of Inglewood now a thing of the past. Pele towers recall the border struggles fought out between Scots and English and the ancient fairs and festivals the more peaceful times which followed. The days of packmen and drovers live on in Appleby New Fair, nowadays a major gathering point for travelling folk, and the arrival of the Settle-Carlisle railway, from which one might still enjoy languid views of a richly varied landscape, opened up the valley and its farm produce to a wider, national, market. The rich history of the vale is brought to life in this beautifully illustrated celebration of a region whose uniquely distinctive past makes it so attractive to today’s curious visitor. In Lacy’s Caves, just up-river from Nunnery walks on the River Eden near Armathwaite, an ardent young lover, one imagines, has carved a bold heart in the soft red sandstone. The heart is pierced by a time-honoured arrow and bears the legend MO x FS. Everywhere along the river Eden for three millennia or more, man has left his trace, his mark. The river has flowed resolutely on, sometimes breaking its banks as we know to our cost, sometimes being curbed and channelled, but the Eden remains today, much as it was three thousand years ago. Lacy’s Caves are probably the work of man rather than nature. In this case Lt Col. Samuel Lacy of Salkeld Hall, a fine eighteenth century gentleman, had five rooms excavated to provide for a cool wine cellar. Local legend has it that the caves were used to entertain and impress guests and that Lacy, in an ultimate gesture of one-upmanship, employed a resident hermit. Near Great Salkeld stands one of man’s earliest traces, Long Meg. The “scole mister of Applebie”, one Reginald Bainbigg, in 1600, described this ancient stone circle as pyramides of stone, placed ther in the manner a crown, commonlie called meg with hir daughters”. Later stones are equally mysterious. The Rey or Rere Cross stan byds the road across Stainmore and once marked the border between England and Scotland. It may have been a Roman milestone or it may have been a memorial to Eric Blood-axe, the last Norwegian king of York, who died in a battle on Stainmore in 954. The Eden valley, in the time of the Normans, was key to the defence of the realm. It became a place of castles, Carlisle, Penrith, Brougham, Appleby, Brough, Hartley, Pendragon. All massive stone edifices erected to dominate the surrounding countryside and control the routes into England. Inglewood Forest became a royal hunting preserve. Edward I was reported to have slain four hundred harts and hinds in Inglewood in the course of a four-day hunt. The great families of the area left their mark, none more so than the Cliffords, and particularly the redoubtable Lady Anne. The pillar still stands, - alongside the road near Brougham, fenced off from the rushing, roaring traffic, at the place, near Brougham, - where she bade her last farewell to her much-loved mother. Despite Oliver Cromwell’s displeasure, she pursued her romantic passion for castles, restoring the old family residences from Pendragon to Brougham, but she also had time and money to build the lovely old almshouses in Boroughgate, Appleby, and restore many churches. On a rafter of the Lady Chapel in Appleby Church is an inscription which reads: “Ann Covntes of Pembroke in Ano 1655 repaired all this building”. In succeeding centuries, the towns grew and the railways came and man’s mark on the landscape was ever greater. The viaducts at Ormside, Smardale and Long Meg strode across the valley and the Eden Valley came to appear as it does today. Bill Mitchell tells the story of the Eden Valley with all the ease and fluency of a man who has written over 150 books. As one-time, long-time editor of “Cumbria” magazine, he knows and loves the area better than most. This is a very fine book that encompasses the history, folk-lore and natural history of a beautiful tract of country.